Home | Mises Library | Wind or Nuclear? Energy is like a river; it exists in two ways: flows and stores. When you store energy, you create a dam to capture it. What environmentalists call "renewable energy" is really just the stored energy of the sun. In actuality, there's no such thing as "renewable energy": all energy, even the sun, is limited. Fossil fuels are energy stores as well — specifically, they are stored solar energy, a process that takes millions of years — and they are highly concentrated, ten times more so than, for instance, wood. In terms of wind and raw solar energy, the flow is exceptionally diluted: solar is ten to fifty times less concentrated than fossil fuel. When you can't concentrate it, then the only way to harvest it is to use more and more land. That's the limiting factor for both sun and wind energy. T. Boone Pickens's now-infamous plan would require 1,200 square miles for a single power plant. Compare that to nuclear, which would require only one square mile. Coal is extraordinarily abundant — we'll never run out — and pound-for-pound contains twice as much energy as wood. Coal is a concentrated storehouse of energy. Octane molecules in gasoline, however, are even more concentrated. In fact, they're the densest store of carbon energy we've ever discovered. Pound-for-pound, gas possesses four times as much energy as coal. There's a popular misconception today that gasoline is inefficient and wasteful. Nothing could be more inaccurate. Gas molecules are not only by far the densest form of carbon energy we've ever discovered; they're also easy to transfer because they're fluid. These are two of the greatest reasons we've adopted gasoline. Nuclear, on the other hand, is something else entirely. The public hasn't even begun to grasp nuclear energy. A handful of uranium contains more energy than 100 boxcars full of coal. 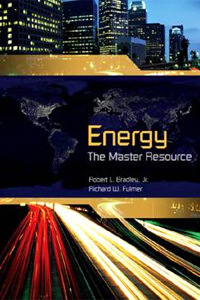 Consumption of energy creates more energy, not less. Despite years of government subsidies (regulators, for instance, have forced utility companies to buy "renewables"), these same renewables generate only about 0.9 percent of our total electricity. The most efficient solar panels currently in use (on the space station) are costly, and their conversion efficiency is about twenty percent, which is not very much. Twelve miles of solar reflectors generate about 300 megawatts, a miniscule amount. Furthermore, those reflectors must be kept squeaky clean, maintained to the hilt, or they won't work. At our current level of technology, no conceivable mix of solar, wind, or wave can meet even half the demand for energy. If, however, wind, wave, and solar are to become more efficient, it is only science and technology — as opposed to environmentalism's plan of blasting us back into the Dark Ages — that will get them there. We begin to know about a resource only when we begin to use it. Knowing about that resource includes a cursory calculation of its quantity. The more we use of it, therefore, the better we become at finding it and calculating its quantity, extracting it and refining it. Thus, the more we use of a resource, the more of it we're able to find. This may sound counterintuitive, but only at first: then you glimpse its awesome logic. The entire history of resource use and extraction has followed this pattern without deviation. Boone Pickens is calling for massive subsidization of the wind-power industry. As with ethanol and recycling and a host of other issues, you must ask yourself again, if these things are so efficient, why do they need to be subsidized? Answer: they're not so efficient. Energies that require massive subsidization benefit absolutely no one; the only reason they need to be subsidized is that they cannot compete on the open market. That fact alone tells you everything you need to know about them: they're simply not good enough yet. When they are, the free market will adopt them naturally. The reason wind power still won't get us very far is that transmitting this power is such a huge difficulty. Wind is also unpredictable; it's therefore hard to integrate into an electrical grid, since grids have to maintain a voltage balance, or you'll get brownouts, blackouts, and power surges that destroy equipment by the ton. The "grid," incidentally, refers to the entire energy infrastructure. It even includes the electrical wires that go into your house. Grid operators spend their whole lives trying to balance supply and demand on the grid. Energy demand changes all throughout the day, all throughout the year. In summer, for instance, demand is higher. Late at night, demand is lower. Grid operators balance all this. Factor in the wind, which you cannot predict more than, at most, five hours in advance, and try pulling all that wind power into a grid, and you'll begin to see how impossible the task is. "Spinning reserve" on an electrical grid refers to the amount of backup power that is sitting there, waiting to go at a moment's notice in case something goes wrong. In general, twenty percent extra power is the standard spinning reserve on the grid. Wind can indeed supplement a grid with this needed twenty percent spinning reserve, but it cannot come close to replacing fossil fuel. Here's what you don't see in the fine print: The vast majority of wind energy needs to be transmitted. Thus, you'll need to step up voltage to 745 kilovolts (which is a lot) so that wind doesn't lose all its energy in the transmitting process. That infrastructure alone — forget the actual windfarms — will cost billions. We'll also have windmills covering the entire great plains. Quoting energy expert William Tucker, "If Boone Pickens's dream is realized, you'll be able to drive from Texas to North Dakota without ever being out of sight of a windmill, just as in Denmark." That is, except for Boone Pickens's backyard. Said Pickens, "I'm not going to have the windmills on my ranch: they're ugly." And that, in part, is why people are already objecting. Windmills are taller than the Statue of Liberty, and they're loud; the Audubon Society calls them "condor Cuisinarts." Wind comes strongest along mountain crests. Thus the Blue Ridge Mountains, the Adirondacks, the Appalachians, and so on would all have their ridges lined with these monstrosities. Yet environmentalists object to the building of one small nuclear plant, which, compared with a windfarm, is tiny. Uranium generates gigantic amounts of energy in a very small space, which wind and solar combined cannot come close to. Those who say otherwise — those who are antinuclear, in other words — have brought the world 400 million more tons of coal used per year, because for thirty years now, since the Three Mile Island accident in 1979, we've been using more coal. The meltdown of the uranium core in 1979 at Three Mile Island was so overblown by antinuclear groups that it went virtually unnoticed that the containment vessel at Three Mile Island had done its job and prevented any significant release of radioactivity. Uranium is abundant, clean, and safe — in technological societies. The catastrophe at Chernobyl — which, once again, sent greens groups worldwide scurrying to their soapboxes — only happened because that state-run reactor was astonishingly unsafe: in the words of Peter Huber, "You couldn't have operated a toaster oven out of it." Few scientists disagree that the discovery of energy at the nucleus of the atom is the greatest scientific feat of the 20th century. All this talk about how we need to "discover a new form of energy" therefore misses the point: we've already done so. It's called nuclear energy. And it's amazing. We discovered that the concentration of energy in the nucleus of the atom is 2 million times as great as energy in the shell of an atom. There are tiny amounts of uranium residue in coal; those trace residuals have more energy potential than all the coal itself. Chemical energy, which is everything from wood to crude oil to gasoline to coal, consists of playing with the electrons, changing their energy state. With nuclear, however, the big discovery was that there's far more energy in the nucleus of the atom. Therefore, it produces a far, far smaller "footprint." In fact, there's really no such thing as "nuclear waste": a nuclear reactor is refueled by its waste. In other words, almost all "waste" can be recycled. Indeed, ninety-five percent of a spent nuclear fuel rod is natural uranium, and so it can be put right back in the ground, just as it was found. The radioactive part constitutes only about five percent, but of that, half is uranium and plutonium, and so it can be recycled as fuel — specifically mixed-oxide fuel, which is exactly what the French have been doing for twenty-five years now. After twenty-five years, the French store all their so-called waste in one room, under La Hague, which is about the size of a basketball gymnasium. Why haven't you heard this? A writer for the New Yorker magazine named John McPhee in 1974 published a highly influential book called The Curve of Binding Energy, which convinced President Jimmy Carter (et al.) that people could steal used plutonium from nuclear plants and makes bombs with it. But this is untrue. Nevertheless, solely on the basis of this detrimental misinformation, our country now has fifty thousand tons of nuclear "waste," because our government won't allow nuclear plants to reuse it. The stated policy of the Department of Energy (DOE) is "not to reprocess" a perfectly reusable byproduct — and all for absolutely no good reason. That is why Yucca Mountain is unnecessarily, and at great cost, being built in southwestern Nevada to store a nuclear "waste" that could instead be simply and efficiently reused. Nuclear "waste" is also used for medical isotopes. Over forty percent of medicine now is nuclear medicine. Currently, we must import all our nuclear isotopes because we're not allowed to use any of our own. This is not only profligate; it's a kind of lunacy. We're the only country in the world that doesn't reuse its nuclear byproducts. Nuclear energy is the cleanest, most efficient energy we have — by light years. Anyone who tells you differently, is flat-out wrong. [bio] Comment on the blog.